As I mentioned in my May Favorites video, a fun polish I've been playing around with is the current nail trend: crackle polish! It seems like each new year there is a new gimmicky nail polish trend that can mayhaps be amazing and mayhaps be a little meh. Honestly I was very hesitant about crackle polishes at first because they just didn't seem very pretty. It wasn't until I saw dear Yasumi of Worship at the House of Blues have her post on her China Glaze Crackle Glaze in White on White here that I decided YES! I want to try it out too! Crackle on my ring finger. Too in love with the base polish to cover it all. I'm a timid crackler! Baby steps! I got a bit more adventurous and crackled my thumbs also. OMG I am in love with your nail polish!!! I never ever liked crackle polishes until I saw the silver and now the white! Thank you so much for sharing! Very pretty. Reminds me of Japanese crackle ceramics! interesting. i will have to try this out myself. i have seen it on blogs for a while, but it was nice to see an actual video of the "crack process" haha. I am also very weary about crackle polish >.< to be honest I think the premise is a bit silly - I thought till now everyone was avoiding cracked polish!! But it's a unique look, and unique = good right? I love crackle nail polish! I dont do the black but I love the turquoise and pink color china glaze has. I also picked up the silver one from OPI for sephora since I couldn't find the regular OPI at ulta. I love the silver over a neon! I'm going to pick up the gold one too. The silver is very metallic and shimmery. It's not too opaque so the undercoat gives the shatter a tint of color. OPI Black Shatter cracks a lot better than the China Glaze and no two nails ever look the same, but it is a bit hefty on the price tag! While I love the SH color, I'm still not sure if I dig the crackle. I can remember when it was big in like 1998 and I played with it, but hated the texture. I may give it a try to see if I see things differently now than I did 13 years ago. Who knows, I may like how it looks and feels now! I just got more colors from barry m! Heehee. I would like to someday try and own one! haven't been a fan of the crackle polish...until now!! i love it in the white crackle!! thanks! Cute before and after. I only have the OPI Silver Shatter unfortunately, but the white is oh so cute. Try the crackle in strips! My clients love it- an easy way to get a cool pattern! 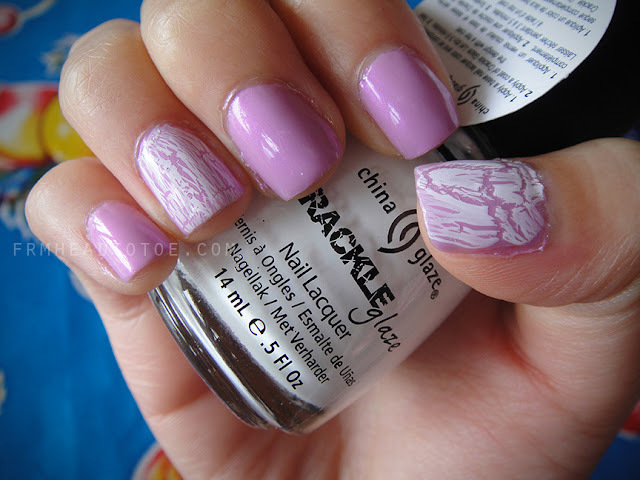 i originally didn't like the whole crackle trend, but now I love it! I have the whole collection from China Glaze, minus the purple (not really to crazy about the shimmer finish). Also, I think you may have mistyped the China Glaze white crackle, it is actually called Lightning Bolt. I personally don't like the crackle polish. It reminds me of the time when my friend had painted her nails white, and a few days later had taken a needle to scratch through the nail polish making such similar designs like the crackle polish (she did this because she was bored). I love the pink polish you have on though. I know you're busy and you probably don't get a chance to read and answer all reader's questions. However, last time I had asked how often you washed your makeup brushes and what you used to wash them, but you didn't give a response. Some people have told me once a month, weekly, and others say right when they're done using the brushes. Some have used baby shampoo with water to clean the makeup brushes. I'd appreciate your input. Thanks and take care! I love using crackle nail polish, but it can be finicky! If you mess up because you didn't use enough paint then its over! I've only used black crackle, which I think looks nice, but I don't really like the white crackle that you used. Try black or a color on top of white? K: I usually use shampoo to clean brushes for a deep clean every couple of weeks. When I'm not rushed, I like to clean brushes between uses with a Wet Ones wipe or MAC brush cleaner + paper towel. Baby shampoo is definitely the most economical option in my opinion! Hope that answers your brush cleaning questions! i saw the black crackle and i wasnt so into that color, but after seeing the white one im in love and im on the search for this color! ah i prefer it without the crackle though...altho if i had to pick, i def. prefer white crackle than the silver one! Thanks for the demo Jen! I really love that Sally Hansen polish! It's like my perfect pink shade!!! I also love the white shatter!! I have only ever tried a black one, and I didn't mind it, but I love the white!